No matter how hard I try to stay away from my Winter comfort eating, I just don’t seem to be winning! I dream of delicious desserts to chase away the blues….the only trouble is – my girly curves are very curvy at the moment. Like my good friend says, ‘Curves are the new black’! I simply can’t resist sharing this recipe…its one of my favourites! Pour in the cold water and vanilla essence. Stir in the melted butter and stir well to combine. Heat the sunflower oil in a 28cm AMC pan on medium heat. Slice the bananas lengthwise and dip them into the batter. 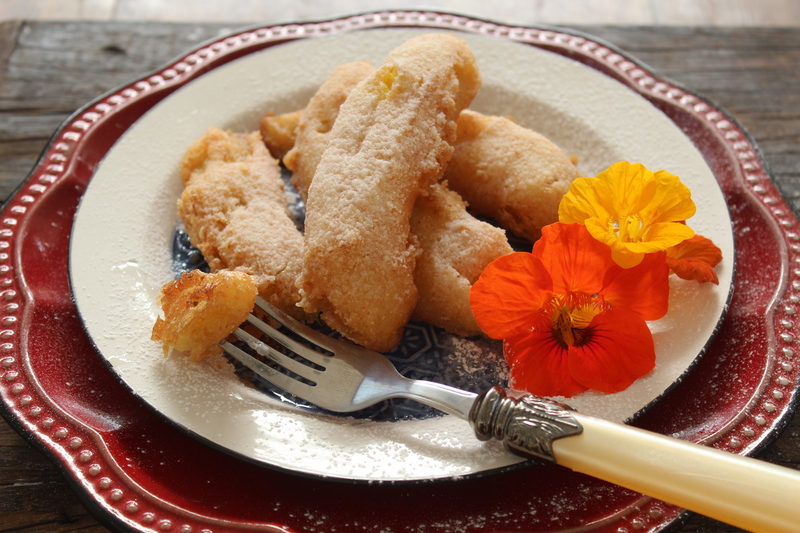 Gently lift the sliced bananas out of the batter and deep fry until golden brown. Remove the bananas from the oil when they are crispy. Drain in a strainer and then dab the fritters with absorbent paper towel. Grind the basmati rice in a coffee grinder for best results. Always use half ripe bananas for this recipe. Ripe bananas will break when dipped in batter. Dip the banana slices in the batter one at a time to prevent them from breaking. Finely ground rice makes the batter crispy and adds a crunch as well.